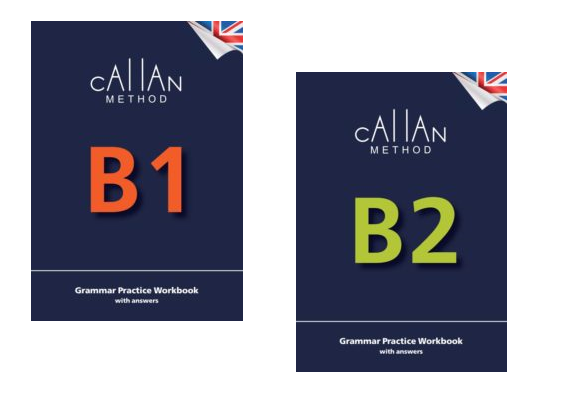 The Callan Method General English course consists of 12 levels (or “stages”), and caters for all learners, from total beginner to advanced. It is taught at Callan Accredited Schools and Online Partners, by Callan Registered Teachers and through Callan Online. The content of the Callan Method has been decided on with the CEFR (Common European Framework of Reference) and popular international English language exams firmly in mind. Grammar is taught throughout the Method. Rules are clearly explained and then immediately put into practice and constantly revised. During Stage 5 or 6, most students will be ready to prepare for exams at B1 level, and in Stage 8 or 9 they will be at B2 level in terms of vocabulary, fluency and pronunciation, reading and listening comprehension, and usage of grammar. Different schools may then run short courses to equip students with the techniques needed for specific exams such as Cambridge Preliminary or First, IELTS, TOEIC or TOEFL. Student workbooks are available to help students practice the grammar required at B1 and B2 levels. By Stages 11 and 12 (the highest levels), the vast bulk of language being practised is appropriate for learners at level C1 of the CEFR. A great method, an excellent teacher who listens carefully and corrects all our mistakes, even the little ones, and gives short explanations where needed. I’m very satisfied. The Callan Method is a fast and fun way of learning English. This method allows me to improve my pronunciation and speaking. I like Callan Method because it has improved my English speaking and listening very quickly by repeating sentences and expressions that are commonly used in daily conversations. I love studying at Smile School with the wonderful Callan Method, owing to which you begin speaking English automatically. You learn a lot of new things every lesson but it seems so easy because of constant revision. The Callan Method is extremely effective. Studying 8 stages not only enabled me to communicate with foreigners, but also helped me achieve my professional goals. This is why I intend to carry on with my studies and complete all 12 stages. I did not actually think it would work out. However, to my surprise, I saw the results just in a couple of weeks! I still cannot believe that but it is a fact. I highly recommend that you also try it out and you will not regret! I like that the teacher speaks quickly and corrects pronunciation mistakes. First of all, I found out that I can speak in this language and I have gained confidence in speaking English. I have moved from theory to practice in communicating with various people at work and with tourists who visit Krakow. Like a chipmunk on speed riding a bike running on liquid helium. I have no time to think in Japanese in my head because I have to answer the question immediately. This trains me to understand English without Japanese and respond quickly. Remember that you will only benefit from the Callan Method if it is taught correctly. Always look for the Callan Method Accredited School logo.